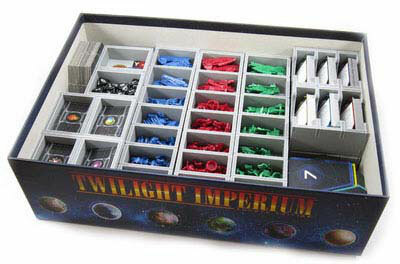 Compatible with Twilight Imperium 4th Edition®, and has space provided for future expansions. Note: Insert designed for game with external box dimensions of 30 x 43.3 x 13.4 cm. Here you can see the top layer of trays. Please note that there are two alternative methods of storing this insert in the game box, please see below for the second option. Note on the left there is space left for expansions. This is to future proof the insert, and we will be providing an additional insert for this gap when the expansion is released. The boards hexes and numbered tiles are stored in an open slot in the bottom right corner. Their is one tray for each colour of player piece. 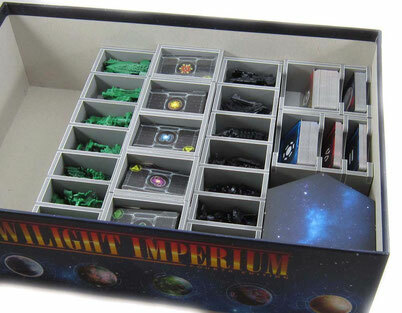 Each tray has individual slots, with ships and other pieces being divided between them as shown. 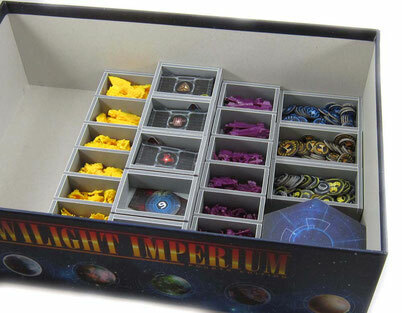 There is also an individual tray for each faction. These store the faction tokens and also the cards unique to it. There is space for these cards to be sleeved. 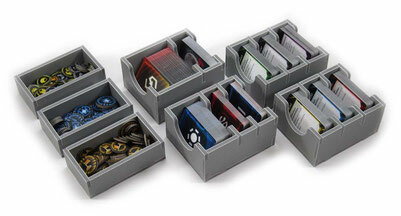 These are the card trays and the other larger trays for the game tokens used by all players. Again all cards can be sleeved. There is space provided for additional cards to be added to the player colour decks from expansions. Once all the trays are in the box, the rules and player boards go on top. 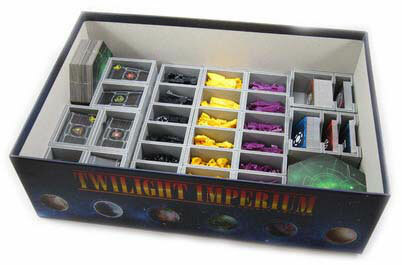 This insert can be arranged in the box in an alternative way prior to the future addition of the expansion trays. 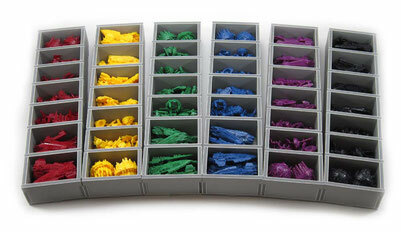 This image, and the ones below, show how the tray can be organised to fill the bottom of the box. Of course, in this case the game cannot be stored vertically.